The main difference between hierarchical network and relational database model is that hierarchical model organizes data in a tree-like structure while network model arranges data in a graph structure and relational database model organizes data in tables. Database models help to create the structure of the databases. In addition, they also help to define how to store and access data in DBMS. In other words, it is important to follow a database model to store data on a database of a DBMS. There are various models used for logical designing of databases in DBMS, and Hierarchical, Network and Relational are three such database models. Hierarchical database model arranges data in a structure similar to a tree. First, there is the main root, which is the start of the tree. Other data are arranged under the main root. Furthermore, other nodes connect to the main node as children nodes. Another set of nodes are connected to these children nodes. Moreover, this model helps to represent “one to many” relationship among two data types. As shown in the above diagram, the nodes connect to each other forming a parent-child relationship. Each child node will only have a single parent. 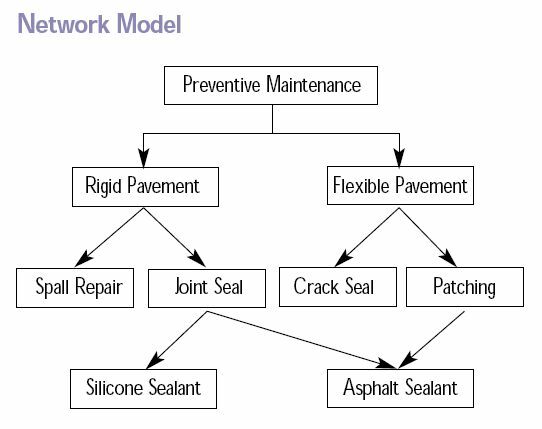 A network model is an extension of the hierarchical model, which arranges data in a structure similar to a graph. Unlike in the hierarchy model, a node in the network model can have multiple parents. Furthermore, the data in the database created using the network model will have more relationships. Furthermore, this type of linking among data helps to access data easily and much faster. This model helps to represent many to many relationships. Relational database model store data in tables. Therefore, the basic structure of data in the relational database model is tables. Tables are also called relations. Each table has rows and columns. A row represents a column while a column represents an attribute. Moreover, it is possible to represent one to many and many to many relationships using this model. Furthermore, E.F.Codd introduced the relational database model, and Codd’s 12 rules help to check whether a DBMS is a Relationship Database Model. A hierarchical model is a structure of data organized in a tree-like model using parent-child relationships while network model is a database model that allows multiple records to be linked to the same owner file. A relational model, on the other hand, is a database model to manage data as tuples grouped into relations (tables). Hierarchical model arranges data in a tree similar structure while network model organizes data in a graph structure. 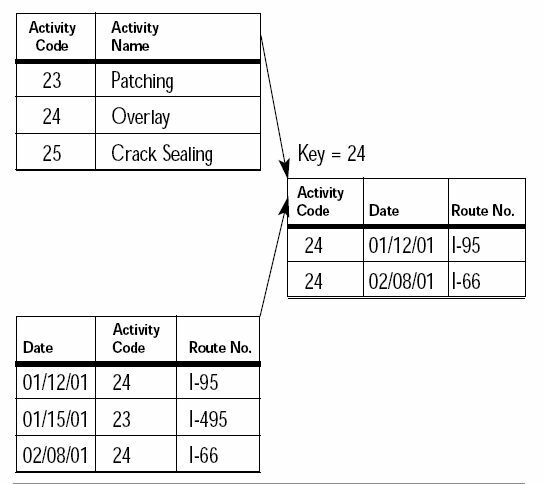 In contrast, relational model arranges data in tables. Hence, this is the main difference between hierarchical network and relational database model. Moreover, an important difference between hierarchical network and relational database model is that while a hierarchical model represents “one to many” relationship, a network model represents “many to many” relationship. Furthermore, relational model can represent both “one to many” and “many to many” relationships. 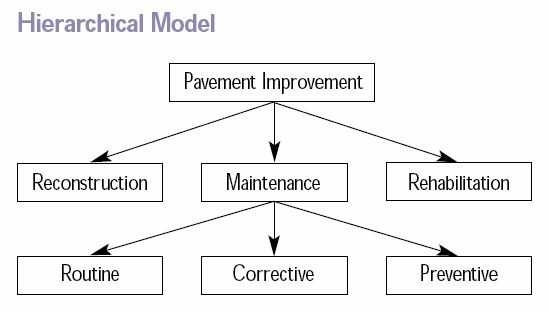 Although it is difficult to access data in the hierarchical model, it is easier to access data in the network model and the relational model. Also, another difference between hierarchical network and relational database model is their flexibility. The hierarchical model is less flexible, but the network model and relational model are flexible. Database models help to arrange data in the databases of DBMS. 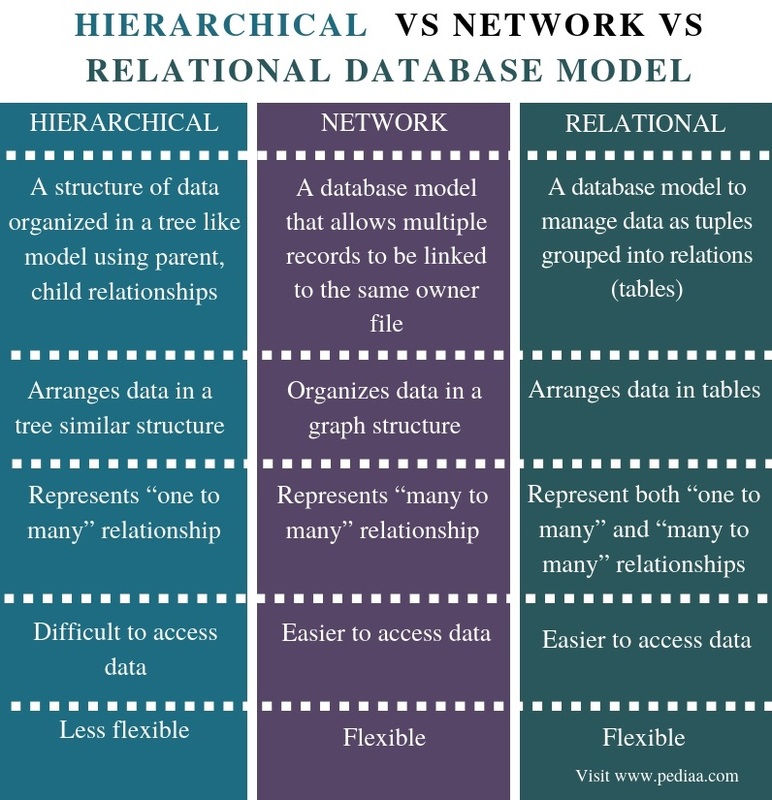 The main difference between hierarchical network and relational database model is that hierarchical model organizes data in a tree-like structure while network model arranges data in a graph structure and relational database model organizes data in tables. 1.“DBMS Database Models.” Studytonight, Available here. 2.“Network Database Model.” Computer Business Research, Available here. 3.Citation Machine: Modern Language Association 8th Edition Format Citation Generator for Journal Article, Available here.